Let these penguin cupcakes coming marching onto your Christmas dessert table, or any time of year, perhaps at a Happy Feet or Surf’s Up party? What You Need: 1 cupcake (baked and cooled); icing tinted light blue; 2 thin mint cookies (we used Necco); 2 Tic Tac mints; bit of orange fruit roll; white icing. How to Make It: Frost cupcake blue. Using knife, cut 2 thin mints in half. (You’ll have an extra half, and we say just eat it. Or make more penguins.) Arrange one half horizontally for head and the other two, splayed out, for wings. Cut bit of fruit roll into triangle for beak. Add 2 Tic Tacs for feet. For eyes, you can use a decorating bag and tip 1, 2 or 3 to pipe eyes, or just wing it and dap them on with a knife. 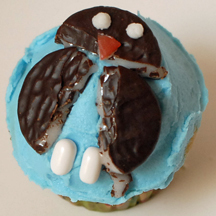 This entry was posted on Sunday, December 2nd, 2007 at 10:27 pm	and is filed under bird cupcakes, Christmas cupcakes, winter cupcakes. You can follow any responses to this entry through the RSS 2.0 feed. Responses are currently closed, but you can trackback from your own site.